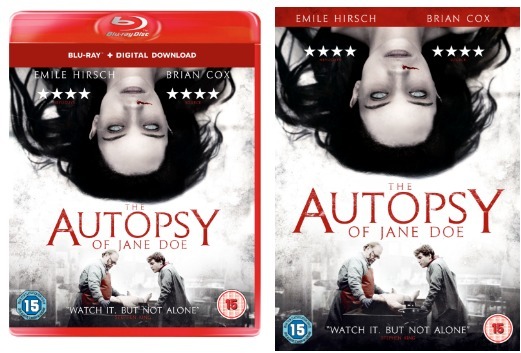 Coming to DVD, Blu-Ray and VOD on the 26th June 2017 is THE AUTOPSY OF JANE DOE. Starring Brain Cox (Manhunter), Emile Hirsch (Killer Joe, Speedracer, Into The Wild, Lone Survivor). Ophelia Lovibond (Guardians of the Galaxy, Nowhere Boy, Man Up), Michael McElhatton (Game of Thrones, The Hallow) Olwen Kelly as Jane Doe. Directed by André Øvredal (Trollhunter, Mortal) and produced by Fred Berger (LA LA LAND). An ordinary autopsy turns into a nightmarish ordeal for father and son morticians, played by Brian Cox and Emile Hirsch, in a brilliantly macabre white knuckle horror thriller that’s ‘scary as hell’ (Crave), and ‘not for the squeamish’ (Hollywood Reporter); and none other than the masterof horror himself Stephen King raves “Watch it... but not alone”.